Wearing his backpacking gear, Greg Behrens is thanked by Rotarian Missy Renner, speaker sponsor for the day. Photo by Michael Barrow, M.D. 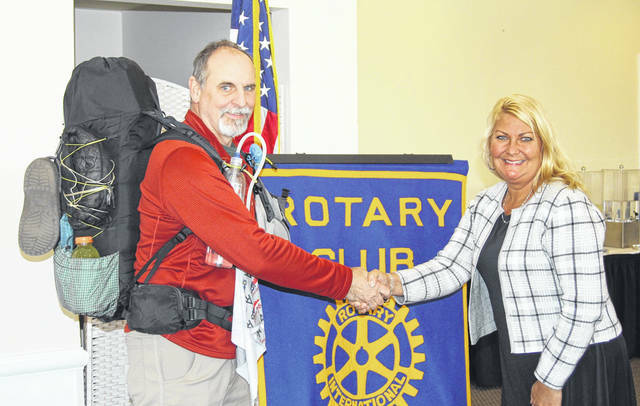 CLAYTON — Greg Behrens, retired assistant principal, athletic trainer, and teacher from Northmont High School, recently spoke to the Northmont Rotary about his summer trek. The Appalachian National Scenic Trail, generally known as the Appalachian Trail or simply the A.T., is a marked hiking trail in the Eastern United States extending between Springer Mountain in Georgia and Mount Katahdin in Maine. It is about 2200 miles long and is a part of the Triple Crown of long-distance hiking in the United States. Conceived in 1921, built by private citizens, and completed in 1937, today the trail is managed by the National Park Service, U.S. Forest Service, Appalachian Trail Conservancy, numerous state agencies and thousands of volunteers. Behrens trained for many months in preparation for his hike. Taking nearly four months, he started in Georgia and ended at the trailhead at Mount Katahdin in Maine. He shared about his experiences with beautiful pictures of scenic vistas, wildlife encountered on the trail, the rugged camp life that he had, and the thrill of completing such a daunting experience. https://www.englewoodindependent.com/wp-content/uploads/sites/26/2019/02/web1_Behrens-2.jpgWearing his backpacking gear, Greg Behrens is thanked by Rotarian Missy Renner, speaker sponsor for the day. Photo by Michael Barrow, M.D.